Our cyclotron is an ideal instrument for testing how exposure to radiation will affect electronic components deployed in spacecraft. 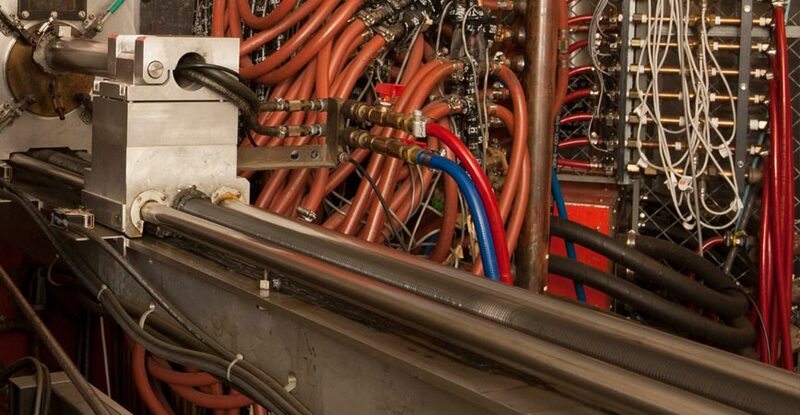 A multitude of coils allows operators to tune the cyclotron to any energy level within its range. 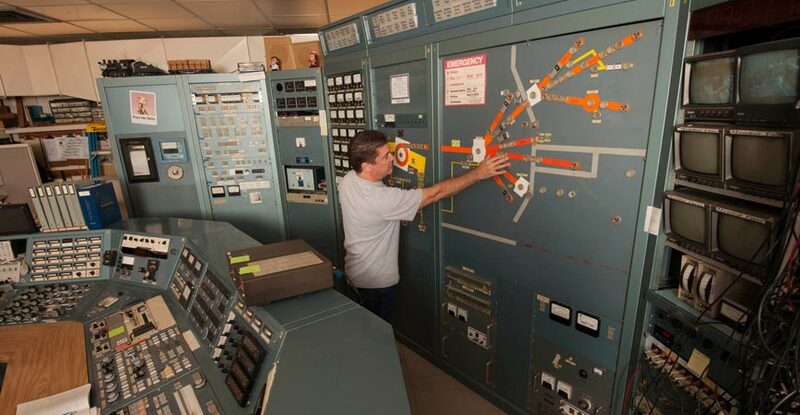 Accelerator operator Randy Kemmler reviews a map of the cyclotron's beam lines. Crocker Nuclear Laboratory is home to a 76-inch isochronous cyclotron built by the UC Davis physics department in 1966 in collaboration with Oak Ridge National Laboratory and the Naval Research Laboratory. Today researchers, engineers and medical professionals take advantage of the unique and versatile capabilities of the machine, one of the few of its kind still in use. Originally designed for research, CNL’s cyclotron can produce high-intensity, external beams of light ions that can be tuned to energies between 4 MeV and 67.5 MeV. The primary particles accelerated are protons, deuterons, helions and alphas. Neutron beams can also be provided. For applications that use low-energy beams, the machine’s tunability and energy levels provide a distinct advantage over most other cyclotrons, which operate at significantly higher, fixed energy points requiring degraders for energy level adjustment. Throughout its range, CNL’s cyclotron delivers a high quality, stable beam with lower energy spread and emittance than beams with energy levels adjusted by degraders. Crocker Nuclear Laboratory is centrally located on the main UC Davis campus, making it easily accessible to faculty and students as well as to researchers and engineers from industry, government agencies and other academic institutions. Our expert operations and maintenance teams have decades of experience in providing consistent, precisely calibrated particle beams tailored to the needs of each user. Studying the effects of radiation on electronics used in space missions. 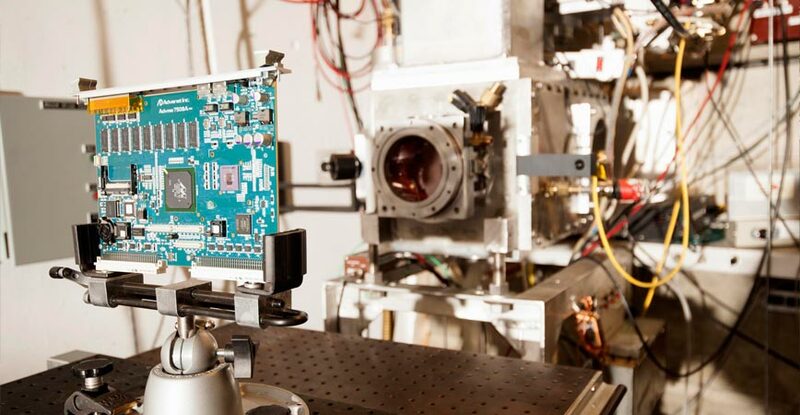 Private industry, NASA and the Naval Research Laboratory are among those who use CNL’s facilities to test the effects of radiation exposure on electronic equipment destined for deployment in spacecraft. The cyclotron’s tunability at lower energy levels is ideal for simulating a range of radiation environments encountered in space. Treatment of ocular melanoma. Since 1994, more than 1,600 patients have been treated at CNL for ocular melanoma, a rare cancer of the eye. The low energy, high quality and stable proton beam produced by our cyclotron is ideally suited for the treatment of this disease. The ocular melanoma program at CNL is administered through UCSF’s Radiation Oncology department. Development of high specific activity 119-Te/119-Sb as a chelated radioisotope for use in targeted radiotherapy (Los Alamos National Laboratory).